ESMO WGI, Barcelona, Spain · 2018, Chajon E. et al. Management of Hepatocellular Carcinoma (HCC) and Liver Metastasis (mets) requires complementary expertise of multiple specialties. Treatment decisions are increasingly complex and physicians must face a wide range of underlying liver dysfunctions and concomitant malignancies. Among available treatments, stereotactic body radiation therapy (SBRT) is well-tolerated. Yet, like with all radiation therapy (RT) techniques, the energy dose deposit needs to be maximized in tumor cells without affecting the surrounding healthy tissues. For such purpose, nanoparticles of hafnium oxide, NBTXR3, were designed to effectively absorb ionizing radiation and augment the dose deposited within the tumor cells only when activated by RT. The first two dose levels at 10% and 15% are completed with 6 and 4 patients respectively. Two patients are currently included at the third dose level at 22%. All currently recruited patients were treated by intralesional injection. No early D LTs nor adverse events (AE) related to NBTXR3 were observed. One grade 2 malaise and two grade 3 abdominal pain AEs were reported to be related to the injection procedure. No serious adverse events related to NBTXR3 nor to the injection procedure were observed. 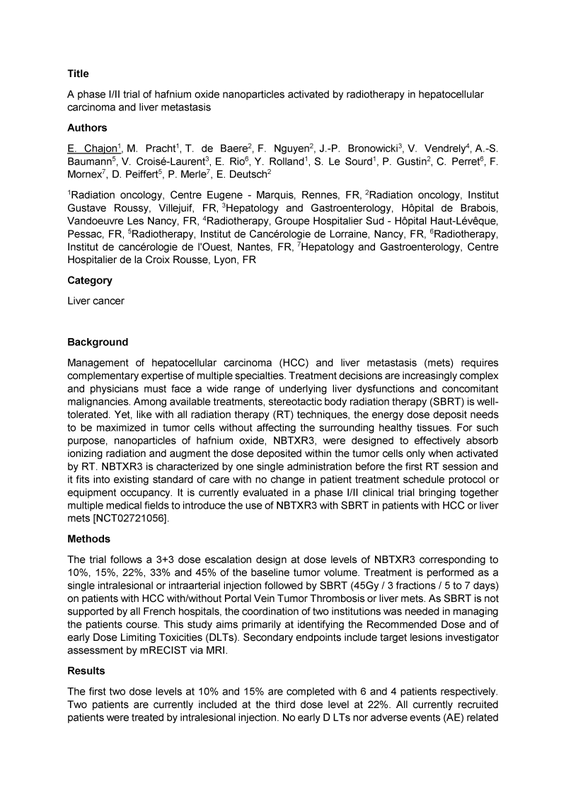 Dispersion and permanence assessments by CT scan confirmed NBTXR3 to stay within the tumor without negatively impacting liver functions nor the reliability of the image-guided radiation therapy. Investigator assessment on target lesions by mRECIST via MRI resulted with the following best observed responses of target lesions to date in 7 evaluable patients: 3 complete responses, 3 partial responses and 1 stable disease.